PACK is a portable computing tool that can be used on any Windows or Mac computer. PACK launches an accessible desktop and gives the user access to four engaging activities: CogLink adapted email, a simplified Internet browser, fun single-player games, and a training program for keyboard, mouse, and email use. The adapted desktop and all applications run from the PACK drive when inserted into a Windows or Mac computer's USB drive. PACK is now for sale! With PACK any Windows computer is accessible. PACK eliminates difficult to read text and small icons from your computer's desktop. You are able to email friends, browse the Internet, or play fun games on any Windows computer. 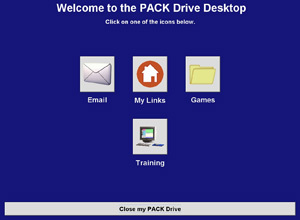 PACK has built-in training programs that help you learn to use a mouse, keyboard, and Coglink email. When you plug the PACK into your computer's USB port, your easy to use PACK desktop automatically replaces the complex Windows display. PACK comes with a Helper link that lets a family member, clinician, or care provider individualize each PACK feature. Updates to your PACK will be delivered to you automatically. There is no need to run special software or ask for updates. People who do not own a computer, and who have access to computers in public environments such as libraries, disability centers, or coffee houses. People who want to use a home computer, but cognitive, visual, or language challenges are barriers to using the Windows desktop. People who have access to a computer, but find it is not used because of the complexity of setting it up and maintaining it. People who have been unsuccessful using computers because they are too hard to learn and there are too many things to remember. 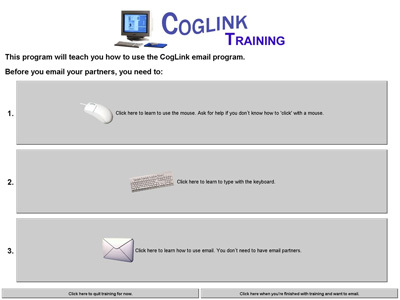 PaCK includes the Coglink automated training program that helps users learn all the basic skills for using the mouse, keyboarding, and email. The training program is positive and designed with proven instructional principles. Each lesson begins with a skills check and places the user at the appropriate level of training. Each lesson provides plenty of demonstration and practice to insure users can successfully email before they begin corresponding with their email partners. The program includes automated feedback but assumes that a support person will be available as needed. PACK has several advanced features that can be added to the "basic" program at a later time. The easy to use "Helper" link allows family members, clinicians, and care providers to instantly add, change, or remove advanced email features and to change links for Internet browsing. A closed list of email partners (buddies) protects the user from receiving unwanted or unsafe email. Optional digital photos help the user read and reply to the correct email buddy. Word prediction helps users spell and write complete sentences. Individualized message templates assist users in creating interesting email messages. A "speak" button that allows users to hear incoming messages and to proofread outgoing mail. A "delete" button lets users to delete messages without having to respond to them. A "save" button allows users to reply to messages at a later time. A "sent mail" button allows users to reread previously sent and received messages. A carbon copy or "cc" function sends a message to more than one person. Capability of sending photo attachments. Capability of printing email messages and attachments. The user-friendly Helper website lets clinicians and care providers change any PACK feature in one easy step. PACK and CogLink features are changed remotely so a care provider does not need to have PACK in hand. Changes are automatically uploaded each time the PACK is used. Group email messages can be sent to all of a PACK user's buddies in one easy step. Email therapy reminders will automatically be sent on a schedule selected by the clinician. Clinicians and care providers can pre-select Internet links that are accessible to the PACK user with just one mouse click. This project is supported by a National Institute of Disability and Rehabilitation Research SBIR grant, Why Go It Alone? : The Use of Public Resources to Enhance Computer Accessibility for Individuals with Cognitive Disabilities, grant number H133S070096. 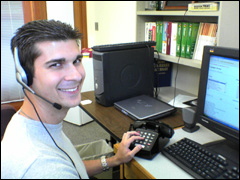 At Personal Technologies, we are dedicated to providing the best customer service and technical support. The PACK HelpDesk staff members are trained to provide personalized phone support to make your PACK experience as simple and as successful as possible. If you want to change a setting (e.g., change print size or background colors), add a new Internet link or email partner, or need help with troubleshooting, just email or call our HelpDesk at 1-800-716-9695. Danny is a young father who suffered a severe traumatic brain injury in a workplace accident. His vision is severely impaired and he experiences problems generating complete sentences when he speaks or writes. Danny lives away from his family in a residential facility. He wanted to use email to make plans for his weekend visits to his fiance and son's home, and his case manager wanted Danny to stay in touch when he made those visits. Part of Danny’s rehabilitation plan involved helping his son read and doing other activities when he visited on the weekends. Danny also wanted to be able to explore the Internet for fun. Our solution was the PACK. Large icons on the PACK desktop made it easy for Danny to navigate to his email, games, or Internet sites. Our Helpdesk assisted Danny's care provider in designing email templates to plan weekend activities with his fiance and to report to his case manager about his activities with his son. Danny's care provider found our Helper website easy to use. We configured his Coglink email so that it used large high-contrast font that Danny could easily read, and we included the optional "speak" feature so Danny could hear his incoming messages and proofread the messages he created using an enlarged keyboard. We added links that Danny could use to listen to stories with his son and to watch videos about his favorite sports team, the Oakland Raiders. Danny's therapist and care providers receive monthly PACK data reports that document his progress. The reports protect Danny’s confidentiality by not tracking the content of his email messages. Each report shows weekly usage statistics and compares use across months. These data have helped Danny's therapist document the written language gains he has made with CogLink. Betsy is a young woman with autism who enjoys beautiful marbles and likes to embroider. She lives with her mother and her aunt, but her brother and sister live some distance away. Staying connected to her family is especially important to Betsy now, because recently both of her grandparents passed away. Betsy wants to use her mother’s computer when she is at home as well as public computer terminals at the local Assistive Technology Center where the staff know her. Our solution was the PACK. 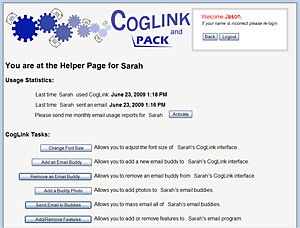 Betsy quickly mastered the simple steps needed to plug in her PACK and navigate through the adapted desktop to her CogLink email. The PACK worked just the same whether she used one of the Assistive Technology Center’s computers or her mother’s computer at home. She had a little trouble learning to use the computer's mouse, but quickly mastered double clicking and other mouse control skills when she used the training programs included on the PACK. Betsy found it easiest to send and receive email when photos of her partners were included on her email buddy list. Because autism makes it difficult for Betsy to think of questions she wants to ask others, our Helpdesk staff helped her aunt create an email template she could use to formulate questions, tell about her own experiences, and share her feelings. Currently, Betsy is trying out some websites that show marble collections, and a friend who shares her interest in embroidery will help locate other fun websites that Betsy will enjoy. We will update Betsy’s report as she continues to explore ways that the PACK can enrich her leisure experiences and enhance her social skills. As part of our iShare case study, we ran into the problem with a classroom of shared computers. It was impractical to install the personal email tool for each student on every computer they might use. There was also the problem of the school's security protocol, which wiped all new applications from the computers every night. Our solution was to give each student their own PACK drive with their personalized iShare tool on it. A student could find a free computer and plug in. No installation of software is necessary; all applications run from the PACK drive. One other benefit to this solution is the ability for the student to take their personalized system home with them for use on the family computer. Again, no installation is necessary and there is no problem moving from Windows to Mac (and vice versa).